Have you started to see all those ads for Memorial Day Furniture Sales? In the retail furniture business, Memorial Day Furniture Sales and promotions represent many months of planning. April is usually quite slow for furniture stores due to a variety of factors. Taxes becoming due along with a shorter retail month as a result of the Easter holiday make for some slow furniture selling days in furniture stores. Many furniture retailers now subscribe to the theory that the best times to promote and become aggressive are around major holiday events. We are not sure which came first the strong holiday sale promotions or the consumers going to the holiday sales. (I guess you could say it is a chicken and egg thing so to speak) Furniture stores and home furnishings retailers have conditioned consumers to find some of the best offers in merchandise and financing during holiday sale events. There is some logic to the theory that more customers go shopping when they are off and have the time. Before we talk about what you will find during the upcoming Memorial Day furniture sale events. Let's talk about the way the events will be framed. As of this writing the Furniche staff has already started to receive emails announcing previews to the Memorial Day Furniture sales. Of course you will see Memorial Day advertising for Memorial Day Weekend and in some cases advertising for the actual day of Memorial Day. Shortly after Memorial Day you will find " sale extended", "sale held over" and finally "final days of our Memorial Day Furniture sale or selling event". The large furniture stores chains will do everything they can to hang their hat on Memorial Day Furniture sales and for lack of better words, they will milk this event as long as possible. We at Furniche do not have any problem with this approach. The dollars spent for advertising and the effort put forth to plan Memorial Day furniture sales is usually substantial. These preview events will be promoted as "beat the crowds or avoid the holiday rush". There is some truth to these statements. The furniture stores will be very busy over the holiday weekend and sales people may not have the time or inclination to give you the best help possible in your buying process. These preview events may have extra aggressive discounts or long term finance offers. The key is to confirm if these discounts or finance offers actually expire at the end of the preview period. If these continue on into the actual holiday weekend then the preview period may not truly be special. Many times these previews are really good deals and a great time to buy. If you are actually headed out of town for the holiday weekend then these events may be the time to buy! The key is to confirm if the offers are truly special. This is the time when the store and the staff have their best foot forward. Special purchase merchandise may be offered for the weekend only and generally the store will push as much new merchandise as possible out to the sales floor. The finance offers for the holiday weekend may be the longest terms and have reduced minimum purchase or down payment requirements. The sales people will be focused and ready to help you. Most furniture store sales people are on commission ( and there is nothing wrong with this from our perspective) and will be focussed on helping you make a buying decision during the weekend. Note that limited stock on hand for special purchase merchandise or special terms for long term financing may create selling and buying urgency. A buying frenzy can start to exist in a furniture store over holiday weekend selling periods. This is okay provided you make sure you have done your homework and research to make the best possible buying decision for your situation. Don't get caught up in buying because "everyone is doing it". If you happen to have been out of town then these days might just be for you. Generally the final days or held over events are mere extensions of the holiday weekend offers. It is possible that you will find a reduced selection of products from the busy holiday weekend. It stands to reason that the really good deals on limited quantity merchandise may be gone. The financing offers will likely be the same but reduced minimum purchase amounts or down payment requirements may have changed. If you shopped during the holiday weekend event but did not purchase, it never hurts to ask if those special offers might be extended especially for you. What are the product categories you might find on special during Memorial Day Furniture Sales? Some stores will have storewide sales with "every item reduced" or a "storewide discount" which may save you on any item in the store. Expect strong offers on sofas and living rooms. Upholstery is always a strong promotional item during Memorial Day furniture sales. Special purchases and new introductions allow the store to present style and color. Dining Sets will be strong advertising fodder for this event. Look for special pricing on 5 pc. dining sets with some going as low as $199 to $299 for the set at the larger promotional furniture store chains. These will look like great values in the advertising and designed to get you to the store to take a look. However, make sure theses sets have the size and scale you need for your dining area. Construction is always important in chairs as they take the most punishment in day to day use. Bedding (mattress and box spring sets) will be aggressively promoted. Memorial Day furniture selling events are great times to find good deals on new mattress and box springs. Take your time to study all of the choices available today. Traditional spring sets are being upstaged by foam and other specialty sleep systems. This may be one of the more important purchases you make. Take your time to know what is available in this ever widening category. Patio and outdoor funiture will be in strong play this time of year. Believe it or not, it is close to the end of the selling season for this category in the more northern regions. Look for some good pricing on "end of season items"
You may find some great long term finance offers during this time. 36, 48, 60 months no interest offers will be available. We have already seen one large and prominent furniture retailer offer up to 68 months of no interest financing. (by the way, this is a really great opportunity in financing) These will generally be equal monthly payments and require a minimum purchase amount and down payment requirements. The minimum purchase amounts are designed to get you to spend more and increase your purchase amount. Be sure to think through your budget and decide if building your purchase amount to meet the minimums makes sense. There is nothing wrong with taking advantage of a long term finance offer if it fits your needs. Of course you should make certain that you can complete the terms of your offer to avoid paying interest. Memorial Day furniture sale events are great times to shop and buy. As always, be sure to understand your needs and to research your purchase selections to make the best possible buying decision. Here's to happy holiday shopping!! Just to make sure we keep our perspective, it is appropriate to remember the reason the Memorial Day holiday actually exists. 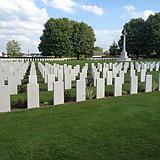 It commemorates the soldiers and civilians that gave their lives for Freedom. 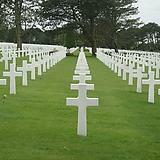 Furniche recently visited the Normandy France area to visit the D Day places of invasion. 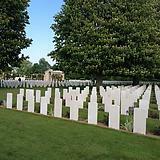 Here are 2 photos of the British Military cemetary at Bayeux, France. 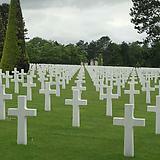 The 3rd and 4th photos are from the American Cemetary.